The Parker Solar Probe has made its second pass around the sun. Read on to learn more about this amazing solar probe. In 1976, NASA launched two solar probes named Helios 1 and Helios 2. In April of 1976, the German-American Helios 2 probe made spaceflight’s closest-ever solar approach, cruising within 26.55 million miles (42.73 million kilometers) of the sun. 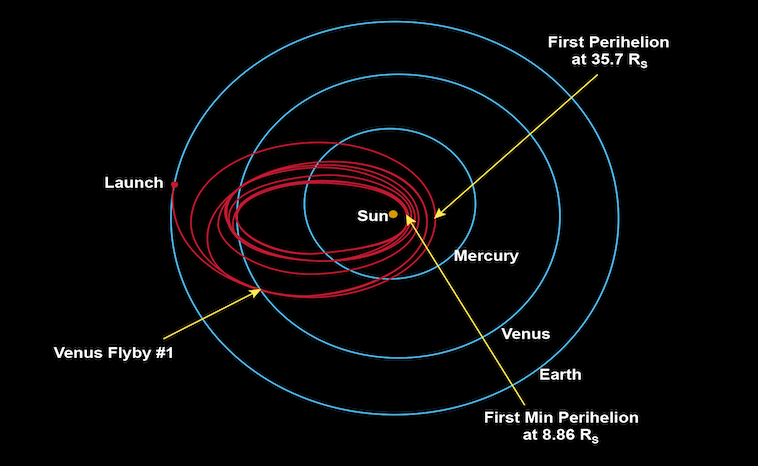 Helios 2 also set the mark back then for fastest speed relative to the sun, at 153,454 mph (246,960 km/h). Last year NASA launched the Parker Solar Probe. That spacecraft will study the sun during 24 close flybys over the next seven years, getting closer and closer to our star with each encounter. Parker Solar Probe is named for Dr. Eugene Parker. He was the first person to predict the existence of the solar wind. The solar wind is the continuous flow of charged particles that come from our Sun. In 1958, Dr. Parker developed a theory about the Sun’s hot corona. In his theory, he stated that the corona is so hot that it overcomes the Sun’s gravity. Scientists had known by 1958 that the Sun was hot. It measured in millions of degrees Fahrenheit. As a result, Dr. Parker said that the charged particles in the corona expand. Furthermore, this expansion bursts outwards in all directions forming the solar wind. NASA celebrated Dr. Parker by naming the Parker Solar Probe after him. This is the first living person to have a probe named after them. What experiments will NASA perform during the mission? Electromagnetic Fields Investigation -This investigation will make direct measurements of electric and magnetic fields and radio waves. Integrated Science Investigation of the Sun- This investigation will measure energetic electrons, protons, and heavy ions. Wide-field Imager for Solar Probe-These optical telescopes will acquire images of the corona and inner heliosphere. Solar Wind Electrons Alphas and Protons- This investigation will count the electrons, protons and helium ions, and measure their properties such as velocity, density, and temperature. Heliospheric Origins with Solar Probe Plus – A theory and modeling investigation to maximize the scientific return from the mission. “The Parker Solar Probe’s observations will help researchers better understand the sun’s structure, composition, and activity.” (NASA, 2019) In addition, NASA also wants to know two things. Why the sun’s outer atmosphere is so much hotter than the surface? What accelerates the charged particles of the solar wind to such tremendous speeds? As the Parker Solar Probe completes each orbit around the sun, it is out of communication with NASA. The radio silence is designed to let the spacecraft focus on keeping its instruments tucked safely behind the thick shield. This shield protects them from the incredible heat of the sun’s outer atmosphere, the corona. After the spacecraft retreats from the sun again in its orbit, the data gathered during the maneuver is sent back to scientists eagerly awaiting the information. In addition to visiting the sun, the Parker Solar Probe will visit Venus as well. Venus’s gravity helps the probe fly back toward the sun. We hope for a successful mission for the Parker Solar Probe. We look forward to updating this story as the mission unfolds. “Free Floating” Planet Has a Star! Comet Flyby Has Mars in an Uproar!